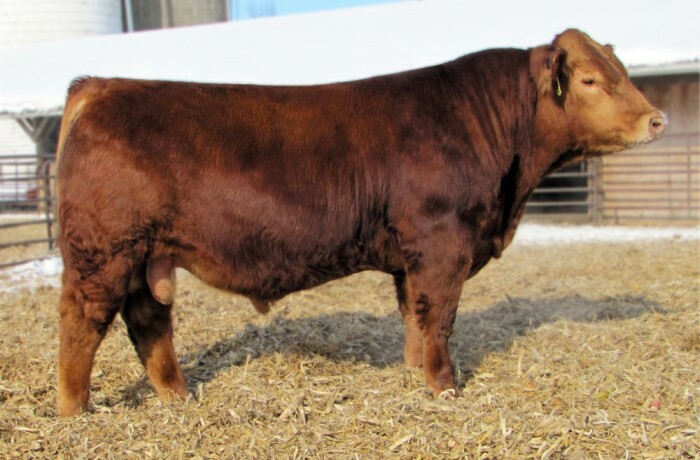 Xpectation is the phenotypical standout and high selling bull at Hook Farms 2010/2011. His attractive phenotype combined with a stellar EPD profile has us very excited about the mating possibilities. He dam is the prolific 141M donor cow that possesses a level udder and sound feet and legs as a eleven year old cow. He has the potential to be the next maternal specialist! His first calves have proven him to be the ultimate calving ease bull. Progeny look to have moderate bone, perfect structure with lots of style and depth. We feel the best mating for Xpectation will be on those powerful red heifers that you look to reduce birthweight and increase calving ease and style. The 701T daughters have beautiful udder structure and teat size and anticipate the Xpect daughters to be the same. When mated to purebred SM females, 36X offspring will be considered purebred (7/8). When evaluating Xpectation you will be impressed by his overall correctness and awesome phenotype.